…A page where I’ll occasionally post about where I am with my own espresso; my techniques, my aspirations, and some of the machinery I’ve worked with. 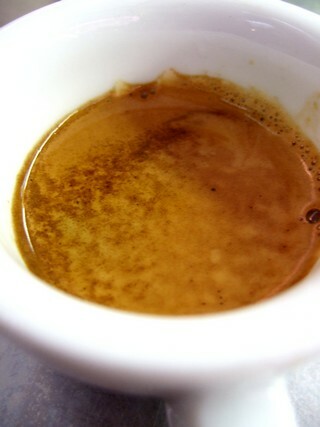 I’ll upload some shots of my shots, and describe where I am on the path towards espresso heaven. And where is that? I guess it’s understanding the craft, the process and the specific beans enough to be able to make consistently delicious espressos, which accurately convey the characteristics of the beans in the best possible light, and which are completely free from brewing flaws. Each great bean or blend (from the right sources!) can potentially make an espresso that is ‘perfect’ in its own very different and individual way, but knowing how to most successfully and consistently get that into the cup for people to experience is something to aspire to. I’m not there yet; it’s a continuing process of learning and discovery within this complex cuisine..! Astoria Plus4U Gloria 3 grp (53mm, PID’d, dedicated multi boiler machine). (Modified – approx 180 steps) Anfim Super GOD Caimano ‘2nd revision’. Dual-preset timer mod. With doser and pedal. 53.2mm US curve Stainless steel and maplewood Reg Barber. My Weigh iBalance 1200 0.1g resolution scales. Ultra-rapid response miniature needle probe K-type thermocouple thermometer and meter 0.1C resolution. Scace thermofilter (borrowed regularly from our fab roaster, thankyou Peter!). My current dosing, distribution and tamping technique. So, I have recently changed my tamping technique, and tentatively believe this might be a keeper, at least for the time being, on our equipment. I dose from the Anfim (smoothly yet rapidly on the pedal, of course), moving the basket during dosing (about 6-7 seconds), so as to layer and distribute the grounds as evenly as possible, whilst retaining a mostly centred cone. Two taps down on the forks. No grooming. A light nutation of 360 degrees without applying pressure other than the weight of the tamper (I’m currently holding the top of the tamper handle with the tips of my fingers for this, as I’m treating it as more of a re-distribution than a tamp). Remove and reapply tamper to tamp (now assuming a door-knob hold on the tamper, with thumb and forefinger on the piston/base), straight down, swift, maybe 10-20lbs. Quick wipe of rim and flanges with hand on way to (careful) lock-in. Until recently, I was not using the nutation. Most was the same as above, except after dosing, following the two taps down on the forks, I would groom (where possible, unless using a very small dose) the grounds level, smooth, and slightly concave with my finger in a circular motion (well dosed grounds, and so no waste levelled-off, everything kept in basket), before tamping lightly just to find a level, then removing briefly, and re-tamping straight down at 20-30lbs, and twisting as above to polish, etc. Through research, experimentation, testing, and the results obtained, I’ve modified my technique many times over the years to arrive at this previous method, which I was using until very recently, and which I had used for quite a while. I have used nutation before, but was not happy with the results. This time, I’ve modified the way I’m doing it, and it is now achieving much of what I would hope for. I have been impressed by the results, I think it might be here to stay. And it is actually less fussy, and quicker! This is in combination with some significant current adjustments to the sort of amounts I dose, the way I adjust the grinder, and the brew temps I’m selecting. There is definitely a noticeable (improved) difference with various related issues of flow rate, blonding, shot times and headspace. All in all, everything seems that much better, and shots have (mostly, when they’re behaving!) never flowed so well, comparatively. But, I need to try this with more coffees and blends, and over a longer period, to be sure. Crucially, these findings are based on using our Anfim Super, a 53mm +4U with thinner dispersion blocks, and a US curve 53.2mm stainless steel tamper. I’ve worked with our Anfim Super Caimano 2nd Revision for a year now, and lurch between thinking *this is an awesome grinder! *, and *this could be better…*. Truth is, it IS an awesome grinder – certainly the best I’ve had the opportunity to work with regularly – and to be fair, ALL grinders could be better. I CANNOT fault the dosing and distribution of this grinder with a dosing chamber and pedal, as we have. Absolutely brilliant. Beautiful, central, clump-free, waste-free, even distribution from the dosing chamber, every time. This makes a huge difference to shot quality, as well as waste. I RARELY feel any need to additionally finger groom/distribute any more. This, combined with the precisely timed doses, makes this an awesome grinder for 53mm groups like ours particularly, where, if you want a LOW dose, you simply CANNOT finger groom out unevenness or clumps, or thereby control dose level, or aid distribution. But this brings me to the shortfalls. The results of the timed dose is OFTEN inconsistent. Simply due to the nature of the way grounds fall from the throat between burrs and doser (and gather in various other places), even though the time is adjustable by very precise tenths of a second, this does NOT always translate to equally precise and consistent dose weights in the basket itself. Sometimes you get a big dose followed by a light one. Often times it is somewhere in-between. This can make for sometimes DRASTICALLY different shot parameters if the throw is off. I find adjusting by one tenth of a second can potentially translate to a 0.3-0.6g alteration of dose when successfully delivered, depending on the coffee, but the inconsistency of the delivery of the dose can cause a variation of AT LEAST +/- 0.5g from the ideal target dose from shot to shot (1g total variance) (and sometimes even significantly more). Generally it works pretty well – don’t get me wrong; I’m talking about subtleties for the most part, but it’s far from what you might hope for. Very frustrating! …Using ones eyeballs and judgement, it can be possible to ‘dodge’ a fraction of a gram or so, if you suspect an overdose being delivered from the grinder, by pulling away briefly and missing a single rapid swipe of the pedal, towards the end of dosing a basket. This can save some shots, but it can be deceptive, and is still less than ideal. This, for me, is just ONE of various advantages to having a doser and pedal used in a GOD way, rather than a fully doserless grinder. Timers are a less than perfect solution to GOD dosing. As is dosing by volume. But sadly, dosing every shot by weight with anything other than human judgement, is not currently possible, or rather, practical, in a commercial setting. This is one of the (many) frustrations with grinders and GOD. Timed dosing is one of the best (albeit not ideal) options we have though, especially when using low doses in deep baskets, and/or significantly different doses for different coffees, or even for the same coffee, at different stages of freshness or under different conditions. Then there’s the stepped grind. My hope was the timer would override the stepped grind nature of this grinder, making the adjustment essentially ‘infinite’, and to an extent, it does. I have also modified our Anfim so that there are TWICE as many steps as standard (about 180 instead of 90). So, happily, each grind adjustment is HALF as large for us, at the plan cafe. BUT, there are still instances where you can see that a ‘middle’ step between two would be preferable, or rather …stepless adjustment! With this Anfim, you tend to alter dose a little first, and then alter grind later as conditions continue to change, which is a different style of grinding to the norm. This does work well, but again, there are points where you can no longer (or should not) alter dose further, and it becomes essential to alter the grind, but even that small step is sometimes just too big an adjustment, and you are left with no exactly ideal combination of settings, whereas a slight adjustment with a stepless system would probably maintain the perfect shot parameters, flow rates, and taste. It has 75mm flat burrs… I’ve had little experience of conicals, and so can’t really comment on how this type of grind differs to conical… Some seem to rate flat burrs, others not… Some say they’re just different… And some say there is almost no discernible difference! I’ve read some reports that flat burr grinders like the Anfim Super can be more clean and fruit-forward in their representation of coffees, whereas the best high-end conicals like Roburs can often have better body, texture, balance, complexity and aromatics, together with easier consistency from shot to shot. This is probably due to the differences in the particle size distribution, and the levels of fines produced by the different types of burrs. The grinder is kind of medium quick, and medium noisy – make of that what you will! All in all, GREAT grinder – especially for the price, and even a year later, there is nothing else that would have ticked ALL our boxes other than this grinder. Right choice – phew! Would love to compare properly though with things like the Compak WBC K10, Robur E, Versalabs, DRM’s, Mahlkonig k30 vario, Nuova Sim Mythos, etc, though. This is my two pennies, for what it’s worth. …At some point I hope to note down some of my thoughts and findings regarding this grinder. It’s one month on now since our new espresso machine arrived, and I think I’m finally beginning to get a feel for it now, but there’s still lots to learn and experiment with, in terms of knowing how to use it to make the best possible espresso as we move forwards. So much is superior and more sensitive to our ancient old machine – stability, temperature, adjustability, screens, water debit and delivery, pressure, flexibility, consistency, etc, etc; but that’s not to say there aren’t still lots of ongoing complexities to deal with when making espresso, especially when you make life more …interesting by using some different coffees for the espresso each week! One curious feature on our machine is the additional temperature control at the group head. Each group has a dedicated PID controlled boiler supplying the brew water, adjustable by degrees of 1C, presumably offset by a certain amount to give a reasonably accurate brew temp display on the screen. But there is also an additional heating of the brew group metal, again adjustable by increments of 1C, which I believe is meant to further aid stability and accuracy, and which is meant to be set at about 2C below the displayed target brew temp. I think this feature might be designed to better guarantee the calculated target brew temp, particularly in situations where the ambient temp might be rather low, like outdoor mobile espresso bars and events, or, simply to help counteract periods of low usage where the groups might otherwise cool off a lot. Either way, I was finding that the temperature of the shots in the cup seemed very hot (rather than the brew water temp necessarily), and so have turned the group temps down a bit lower than recommended, which seems to work nicely, but which may or may not be the right way to use the machine… I need to enquire about these features, and their relationship to each other, further. But by far the trickiest aspect of mastering the potential of the new machine however, continues to be how best to dose and distribute in the narrower groups. Judging both by watching the naked extractions, and tasting the results in the cup, the biggest problem hindering shots (now that temp accuracy, water delivery, etc, are vastly improved) appears to be uneven extractions. 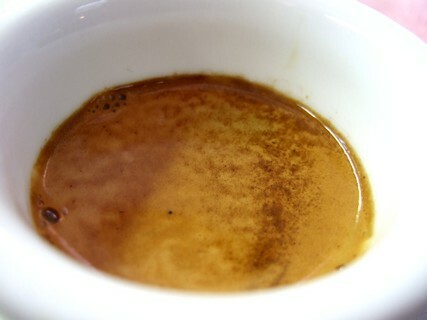 Channeling, and dead spots, etc, leading to early blonding, and pours which issue less evenly than is ideal, seems to be causing both bitterness and sourness to be present, even when you can deduce that the brew temp is set as ideally as possible for the specific coffee. This probably relates more to the quality and dosing of the grind from the grinder into the baskets, and to barista technique, than to the espresso machine – and therefore the focus is now very much towards these first two points when looking for a solution. The issue I’m encountering, as a barista, is that both judging the amount of the dose, and ability to affect distribution of grounds and clumps at the surface by use of the finger, is less straightforward in 53mm baskets than 58’s. Hence, I anticipate (or hope!) that a better and more suitable grinder will (along with continued experimentation with technique) help to iron out these remaining brewing flaws. I hope to see an Anfim Super with a digital timer arriving at the cafe within the next couple of months, which I feel will help to achieve this: The timer will help to better judge and control the dosing (even if the dose needs to be lower in the deep baskets) while the even, neat, clean, and uniform delivery and distribution of the grounds from the grinder will help to aid even extractions with reduced channeling, fracturing, dead spots, and blonding, etc. Combined with the PID temp control, etc, this should further help to get the shots shining as sweet as they should be..! In terms of the primary techniques which I can use to influence things (like the finger levelling/distribution), I have been experimenting with various combinations of patting, tapping, tamping and levelling over the last few weeks. Initially, I felt finger distribution might not be at all possible (safely), because using the technique would cause the dose to be too high in the 53mm baskets, resulting in it making contact with the screens before brewing, and this is certainly still very much a risk, as opposed to with 58mm baskets (with the 53mm single basket, for instance, I’d say you definitely can’t dose that high, without making screen contact). However; if you dose higher gently, with no initial tapping on the forks or counter as you dose, you can then, in some circumstances at least, finger-smooth the lightly piled grounds as normal, and then use some chosen combination of tapping and/or tamping to finish the compression in such a way that there is still a little headroom for the puck to expand (resulting in a dose of about 16-18g). 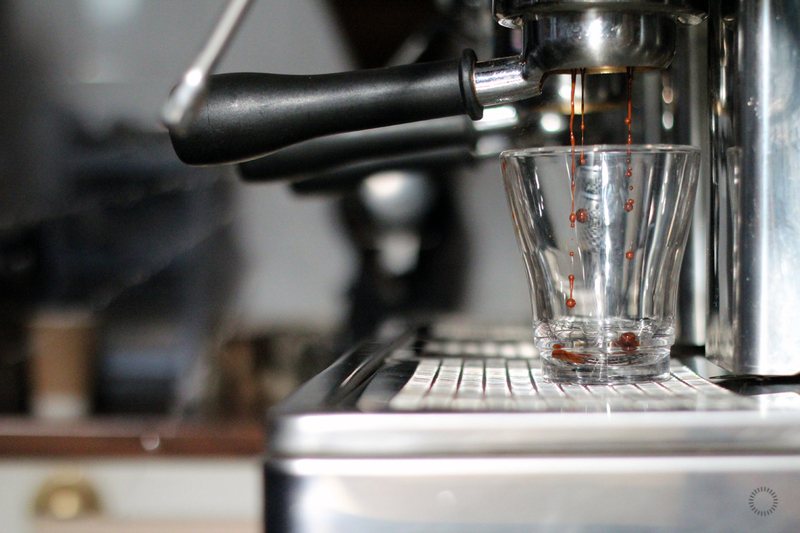 Only when you dose higher though, can you employ the additional finger distribution with the 53mm baskets, and if you (or a coffee) prefer to dose lower, you probably can’t use this technique, due to the basket depth. With an accurate, timed dose, I anticipate that employing the finger technique might become even more consistently possible. And I hope so; because what I have been particularly interested to note, is that (with the grinder and machine I’m using, at least) additional finger distribution still seems (as I suspected) to have a definite and positive effect on extractions, even in the smaller 53mm baskets, in my opinion. True, I haven’t done any scientific, or even rigorous comparative testing, but whenever I’ve swapped back to this technique in the last few weeks of experimenting, after not using it, shots (whilst by no means flawless necessarily) instantly seem to issue more evenly, hang heavier, straighter and truer, and give up the ghost less quickly! Obviously though, there are theoretical issues with the 53mm cake depth and shape that might lead to (over) extraction issues in the narrow baskets, even when they extract ‘evenly’, when you updose like this. But so far I’ve found ‘down’ or ‘standard’ dosing with a finer grind just doesn’t work as well, with the coffees I’ve used, and so I’m happy to continue to updose as best as I can, at present, and perhaps investigate this topic of extraction problems at different levels in the cake more at a later date. With this in mind, I think I’ll be keen, as much as is possible, to continue to gravitate back towards using the additional finger distribution (whilst continuing to ensure sufficient headspace), even once the general dosing and distribution improves with the arrival of the Anfim – because for me, results so far, even with a great new machine, still suggest that the technique does indeed contribute to significantly better extractions, despite much apparent current opinion to the contrary. Unless of course, the much fabled Anfim proves to be near-supernatural, thus negating any benefit of additional grooming..! And then, with better grind quality and distribution, more accurate dosing, more even extractions, and brew temp, etc, pretty stable, it might be possible to better draw some conclusions about even finer points, like the effects on extractions of the cake depth/shape and of updosing in the new, deeper, narrower baskets. I am also eagerly awaiting my new 53.2mm RB tamper base to replace my old 58mm. I have gone for an American curve again, after much pondering of the theory, and certain naked results with the cafe’s 53mm flat tamper, etc, led me to think the subtly convex US curve might be beneficial and preferable in this situation..! It’s almost time for our new espresso machine to arrive! In the end we opted for the +4U from the ‘top three’ machines I selected for the cafe, and I’m very excited to begin experimenting with what I’m sure will be a wonderful piece of equipment!! In some ways the 58mm groups offered by the semiautomatic gb5 might have been preferable for me personally as a barista, due to the extra flexibility to fashionably updose certain coffees without overextraction, produce more syrupy ristrettos, and experiment with a greater range of dosing and distribution techniques, etc. But I felt it was important to focus on what might be the most sensible choice for the cafe, in terms of the best consistency of quality when factoring-in users of varying ability. I feel the +4U will best offer this (with 53mm groups and the option of AV dosing), along with potentially magnificent temperature stability (achieved with PID controlled multi brew boilers), general configurability, and some other important features. In November we hope to twin the machine with an Anfim grinder, which I anticipate will further aid shot consistency, and quality..! 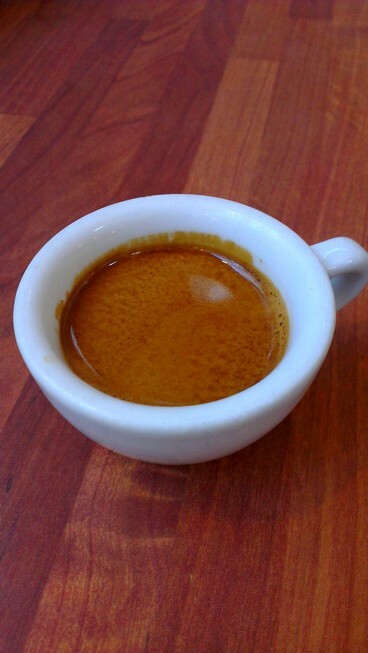 To repeat that old phrase, I increasingly feel that the more I learn about coffee and espresso, the less I know. Things are about to change for me in my working environment, with new, state of the art machinery on the way, heralding an exciting new phase of espresso for me and the cafe! Hence, I thought this would be a good time to post on where I am at present, prior to the improvements. It’s my 6th year as a barista (but only my 3rd making proper handmade shots), and whilst that might seem like a long time to some (and whilst I might just be a slow learner! ), it’s more apparent than ever that there’s (always!) a lot more to learn. The more deeply you delve into the minutiae and subtleties of coffee, and of espresso technique, the more even deeper layers of complexity emerge! That said, this last year has been great for me espresso-wise. I’ve had the ongoing good fortune to be in a position to order an ever changing selection of coffees for espresso for the cafe (all of an outstanding quality), which has given our customers variety, and helped to develop my awareness of different origins and flavours. Also, some fantastic beans, combined with a lot of hard work and planning, helped me to win the Wales and West heat of the UKBC earlier this year, which was a valuable and rewarding (albeit stressful and expensive!) learning experience. I feel the espresso I’m making now has very gradually developed to be better than ever, even using the same old equipment at the cafe. Much of this is due to the afore mentioned quality of the beans themselves which has improved beyond measure over the last year or so. But I think I’ve also gradually developed more subtle, natural, and intuitive practices in my espresso preparation, and have come to understand the machinery I use better, which has also contributed to this improvement over time. Nevertheless, I am still often embarrassed and ashamed by my espresso; feeling guilty that such great beans are not being shown in their best light, and that customers are not always receiving the taste experience they could be. Some of these failings are likely to be down to me (I could always concentrate better, and understand more!). But, having spent a long time developing my skills, I have increasingly felt that the weakest link in our beans/barista/machinery chain is now the latter. Our machine can make some very nice espresso. With some clever TLC and modifications it could perhaps make some very nice espresso. But as it is, there are numerous factors that can cause it to spoil the best, most carefully prepared beans. Preparation techniques that I’ve gradually honed and modified have really helped to counter the failings of the machine to an extent: Careful, circular distribution to create very smooth and even pre-tamp grounds, attention to level tamping, and also the recent removal of any tapping with the tamper (I now just try to ‘catch’ the stray grounds at the sides of the basket as I re-tamp with pressure and polish), all seem to have contributed to better espresso production. But even the most carefully distributed and tamped grounds suffer from bad channeling, and pours are always gushy and watery towards the end, often with very early blonding. Through recent research into machines, I feel this is primarily due to that fact our old machine has an extremely heavy and completely unrestricted water debit, combined with poor screens and dispersion. Temperature fluctuations are also a big problem. Hence, whilst the training of staff and their attentiveness to their techniques and the espresso could aways be improved (myself included! ), I think we have reached something of a ceiling now, certainly in terms of being able to develop my own skills at the cafe further, and in terms of the espresso I can produce for the cafe. With this ‘ceiling’ removed, I think the sky will be the limit, and we will, potentially, have the ability to start producing some stellar coffees for our customers, and certainly espresso coffee of a much more consistently very high standard. Consistency and quality will both be vastly improved. Differences between my espresso and that produced by the other staff will probably become more subtle… I will endeavour to use this new machine as the starting point for a new level of espresso learning, and to continue to further improve what I can prepare for the cafe. It would be easy as a barista to feel comfortable with the good-coffee-more-easily scenario that will now occur (from October), and to stop progressing. But personally, I don’t think this move will necessarily make things any ‘simpler’. Quite the opposite, if anything. I think the variances will be more subtle and elusive, the parameters tighter, and the questions raised will be more complex. And whilst I will no doubt feel I know even less, hopefully I will continue to learn more! But, on a more tangible level, if I can serve our customers more consistently lovely coffee, serve espressos that I’m not constantly embarrassed by; which show the delicious potential of great beans more successfully, and ultimately maybe even get people more excited about great coffee, it will be mission accomplished …for the time being! 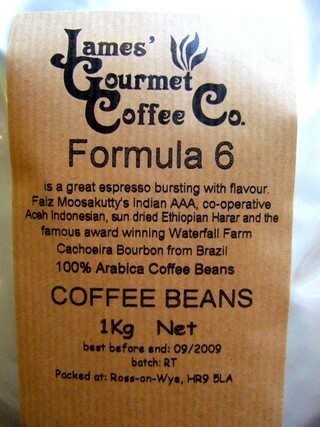 Formula 6, on the other hand, is a wonderfully balanced, carefully constructed, constantly modified, multi-faceted treat – that is amazing both on its own, or with milk, in ristretto cappuccinos. There’s so much going on in this espresso – but not in a busy way – just so many flavours that come together harmoniously and make sense. It has a magical, soft, sweet brightness, that’s balanced perfectly with body and depth. …Traceability (we know what beans are in the blend at any given time, and where they’ve come from – often down to the individual farm or estate). …A type of seasonality (the blend will alter slightly from time to time as different speciality lots come into the UK). …Ethically traded espresso (whilst not part of the Fairtrade brand, Monmouth [and Mercanta] have close buying relationships direct with the growers of quality coffees and agree a fair price for the premium beans; often a much better price for growers than via the Fairtrade brand). It’s a pleasure to be working with such a good espresso which at it’s best is beautifully rich, complex and balanced – lovely notes of chocolate, nuts, and subtle fruit to name the main flavours in the blend at the moment. When it’s just right, it pours a thick, glittering red-gold, and has great flecking in the rich crema. Our espresso is no longer a yellow-green brown; it’s a lovely red-brown! Admittedly, as ever, it’s not always possible to get the best from the coffee with our old espresso machine which can be wildly unpredictable, and which runs quite hot, but the extractions are pretty successful generally, and sometimes excellent!